Recently our AppVeyor account was change from a free to one of the paid plans. When that was done are CI builds stopped working. Here is an example: https://ci.appveyor.com/project/Dronecode/qgroundcontrol/. The error is "Error fetching YAML configuration file from the repository. 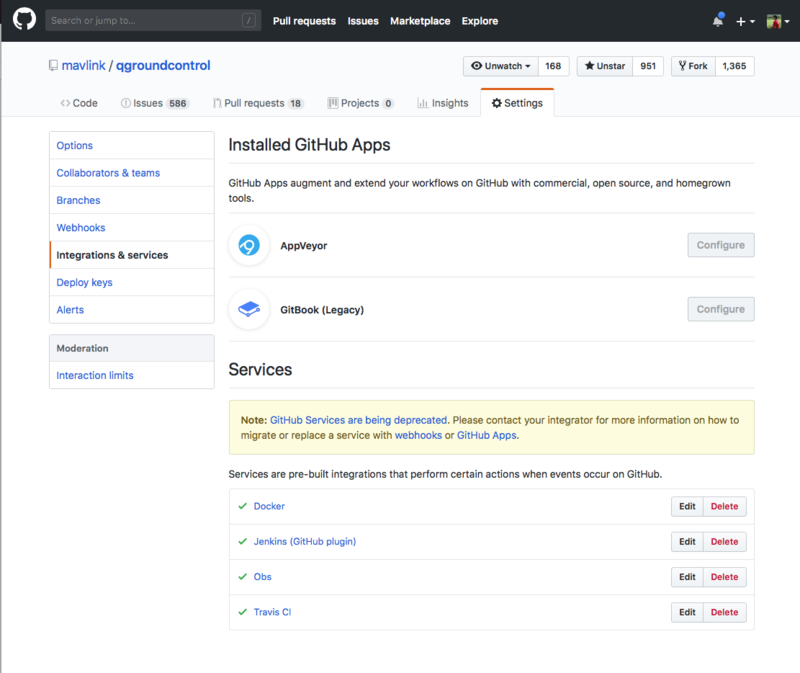 Make sure AppVeyor is authorized to access your gitHub account: AppVeyor GitHub App is not installed for account "mavlink"." When I go here: https://github.com/mavlink/qgroundcontrol/settings/installations. It shows AppVeyor as being installed as a Github app. But for some reason I can't click the configure button. We can't seem to find a way to fix this. I assume there is some setting wrong or possibly some permission wrong somewhere. Can anyone help to figure out what that may be? You mean the configure button is visible but unresponsive/grayed out? Correct. Grayed out/disabled. That's the only thing we can find that seems wrong. Can you have whomever installed the GitHub app on that account re-install it from AppVeyor account settings? When I do that the repository that I've linked to above doesn't show up in the list to pick from. Just to get you building again while we investigate can you revert to oauth app authorization? Can you send a screenshot of the disabled button so we're sure that we're referring to the same thing? This probably means that you do not have enough permissions in the organization to configure GitHub App. You have to be either "GitHub App manager" or owner, according to the docs. As long as this button is available you can select what repositories AppVeyor can access. You can ask organization owner to do that or grant you "GitHub App manager" permissions. Ilya Finkelshteyn closed this discussion on 11 Jan, 2019 09:00 PM.